We Be Reading: Announcing #DWJMarch / #MarchMagics 2019! 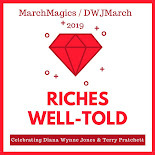 Announcing #DWJMarch / #MarchMagics 2019! Gather around, friends. 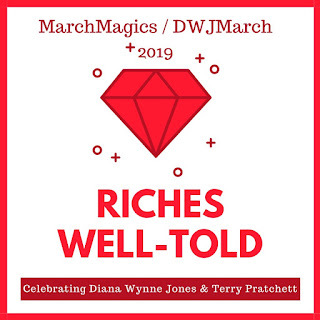 It is finally time to talk about our plans for this year's celebration of the lives and stories of two of our favorite genre authors, Diana Wynne Jones and Terry Pratchett. In three short weeks, we will get to immerse ourselves in some of the best worlds ever created, feast our minds on some of the best words ever written. So, our theme for this year? What does that mean in terms of books? It means we get to read our favorites this year! I want everyone to pick up the books from these authors that never get old, the ones that we've read dozens of times already but plan to read at least a dozen more times. As I look at my shelves, I think about how I could easily spend more time with Derk and the griffins, Tiffany Aching, Chrestomanci, and Death. I want to visit Granny Weatherwax's cottage and take a ride in Wizard Howl's castle. Thanks, everyone! Once I get some answers, I'll set dates for the two read-alongs. Remember when you are posting about this event on social media to use one or the other of the hashtags so that I can find and amplify your posts. Please leave a comment and let me know if you plan on participating this year! Isn't that amazing about the FS edition? I just hope they don't pick a good illustrator. Which one do you prefer? I definitely prefer the more stylized ones (like Julia Bernhard, Jorge Garcia, and Junlin Song) over the more realistic looking ones. It is, after a book full of magic and whimsy! And I think I will reread Nation whether it gets chosen as the readalong or not. Agreed. It was okay but based a little too much on the movie characters and not the actual book descriptions. I was hoping for something fresher than the existing visuals we already had. A Pratchett novel I haven't heard yet! This just made my year! And I just saw that it's available on Scribd in case you have one of those all-you-can-read subscriptions for both the ebook and the audiobook! Thanks for sharing! I'm glad that I've been taking my time and still have about two dozen or so Pratchetts left before I run out of new-to-me ones. If I keep rereading the ones I already know and love, I may make it to old age with a gem or two still saved! Yay for March Magics! So glad this is now officially up and running, thanks! I've suggested I Shall Wear Midnight for selfish reasons as it's the next Tiffany Aching book on my list, and I've already read the first and Equal Rites. But whatever turns up! As for the Howl and Sophie book, I'm happy to read that again. It also happens to tie in with the Wales Readathon event Dewithon as Howl, who is really Howell (or Hywel in Welsh) is from Swansea in South Wales, near where Diana spent a short spell during the war. As I may have mentioned before, it took leaving Bristolto discover that she was a close neighbour of some musician friends of mine in the town. She wrote me a very nice reply to a letter, but sadly she died before I could continue the correspondence. Books like Deep Secret and Isles of Chaldea awoke nostalgic feelings from their inclusion of references to the town I'd lived in for nearly fifty years. OH YAY! I was so excited to see this! :D Howl and favorites sound like an EXCELLENT idea! I've been wanting to reread a few favorites like Fire and Hemlock and Hexwood (and of course Howl's Moving Castle) so this is quite timely! Looking forward to hearing which Pratchett will be picked as well! Hooray! I'm going to vote for Wee Free Men on the grounds that it's been a long time since I read it, while I read Equal Rites fairly recently. Nation sounds fine too. I'm leaning toward Wee Free Men too just because every bit of it makes me grin with glee. It's so fun! I have never joined in before but saw a post about this at Howling Frog Books. I don't usually gravitate to fantasy but this sounds fun! The great thing about both of these authors is that they have books of varying fantasy level so you can find something that you are comfortable with. Or you may just be pleasantly surprised that they make the genre accessible and you can love any of their works! I'm glad you're joining us!